Great pictures and videos vanislander!!! Thanks for the information for telling the rufous and annas apart. I still have not seen anything at my feeder but the ruby throated hummers. It is fun to get pictures and videos from different areas and the different hummers that frequent there. I am getting my sister in Oklahoma to photograph hers also for us. Great RB. 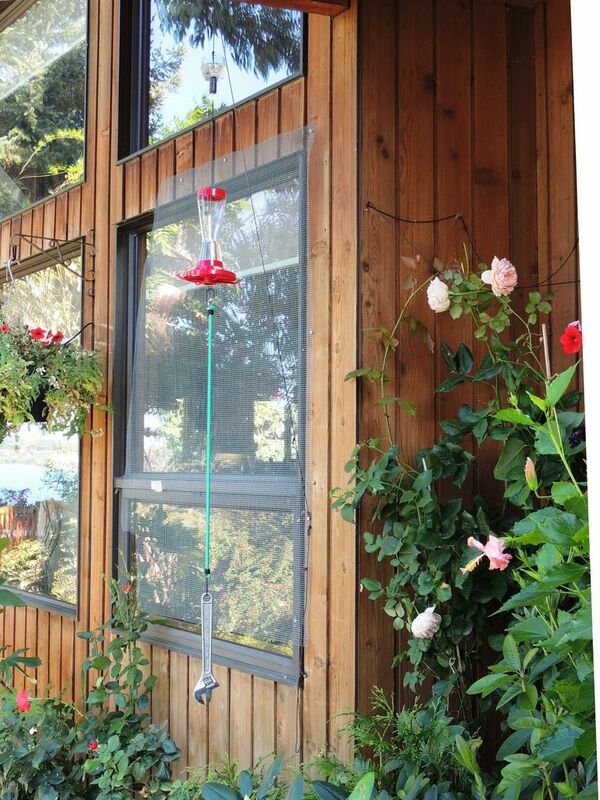 It will be interesting to see your sister's humming birds. 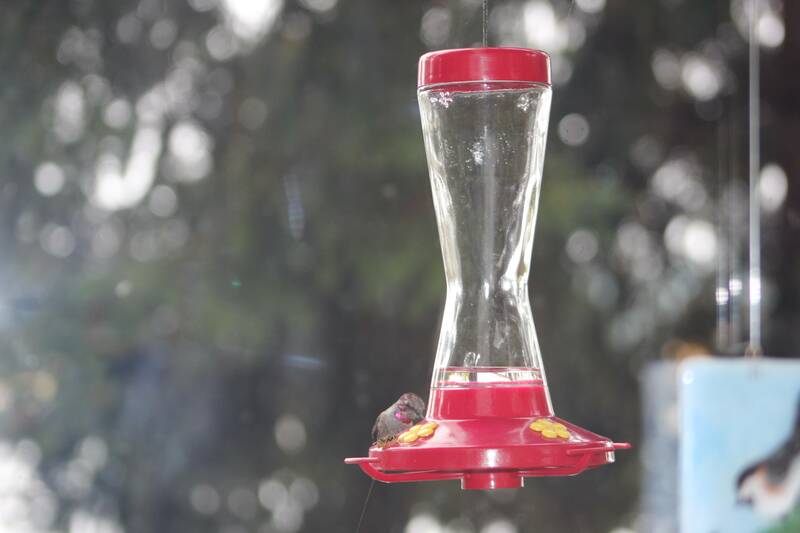 If you'd like a chuckle, today I took some photos of our weighted hummingbird feeder. A wrench (spanner) has many uses! *Note: The mesh over the window is to prevent competing male hummers bashing their heads against the window as they zoom in! 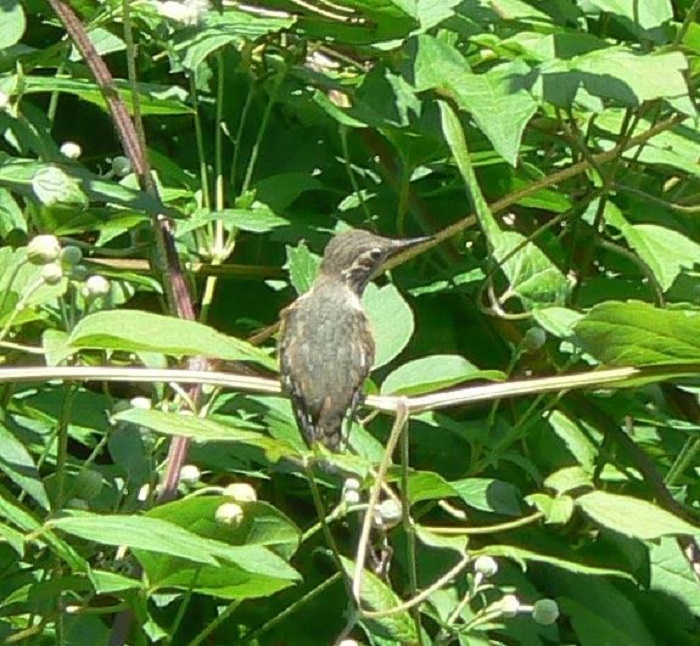 The following posts document a very interesting Rufous Hummingbird nest and fledging, that occurred in my yard in late May 2009. The nest had been observed in the same location since 2007, with the female Rufous returning to it upon her reappearance after her long migration from Mexico - which is way south of us. The first year we noticed that the female Rufous disappeared into our sprawling clematis vine over the garage doors. We were delighted to discover her nest, but sad when that first year the eggs (two of them) were found shattered on the concrete below. The following year there were chicks, but one was found dead on the ground beneath the nest, and we guessed that the other fledged, as there was no sign of it. 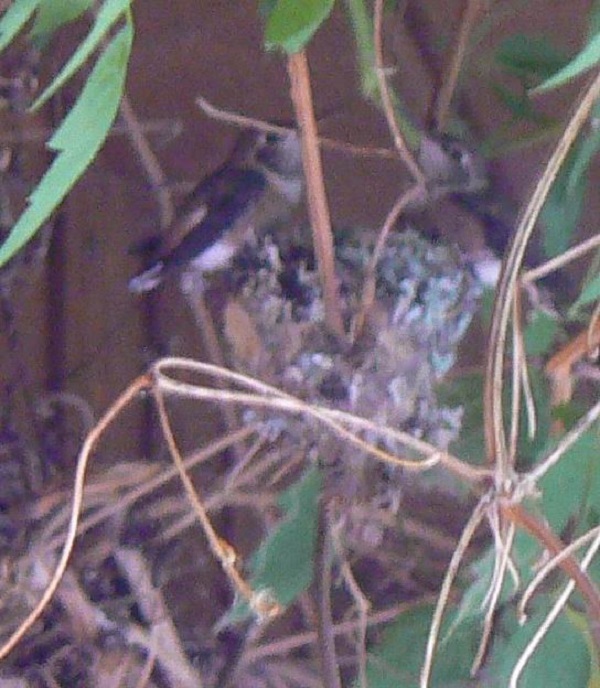 The nest was very hard to see and to get photos, but we managed to get a few, although the quality is not great. The nest had slumped down a bit and we thought it was more vulnerable when more visible, after the previous year's failure. 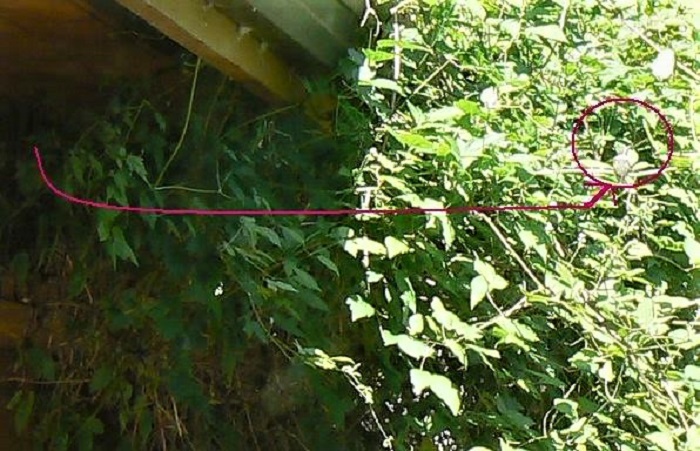 We secured the vine and nest with thick green gardener's twine, so that it was higher under the eaves where it is almost impossible to see because it's so dark there. 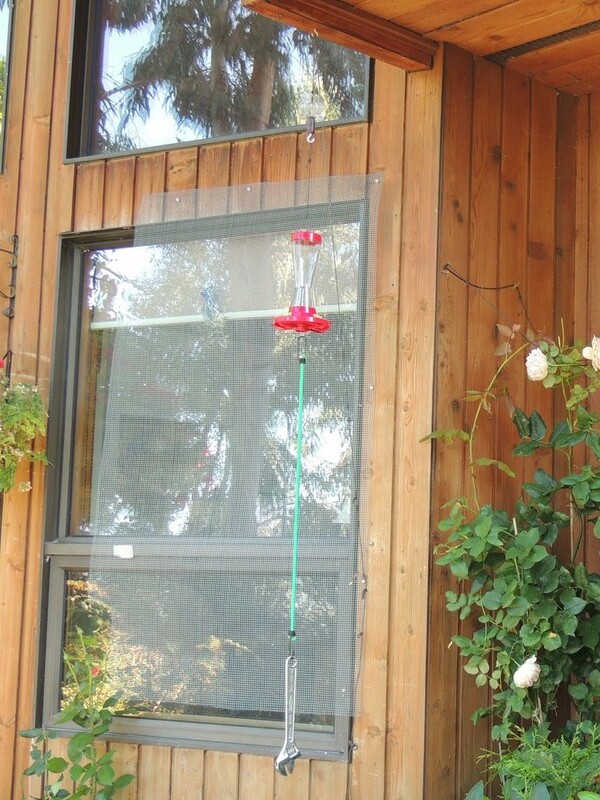 When we noticed a hummingbird flying into the vine early in May we stayed clear of it - never opening that garage door. The little Rufous hummer seemed 'skittish', often flying out from there when we were passing by, but it was clear that she was refurbishing that nest. When I took a chance and went a little closer one day, I could see that momma wasn't sitting on the nest. In fact, the photos I quickly took revealed far more (using the zoom) than I could make out with the naked eye. There appeared to be two chicks in the nest! If you take a close look at the garage door in the above photo you will see there are little dark specks against it - guess what that was? 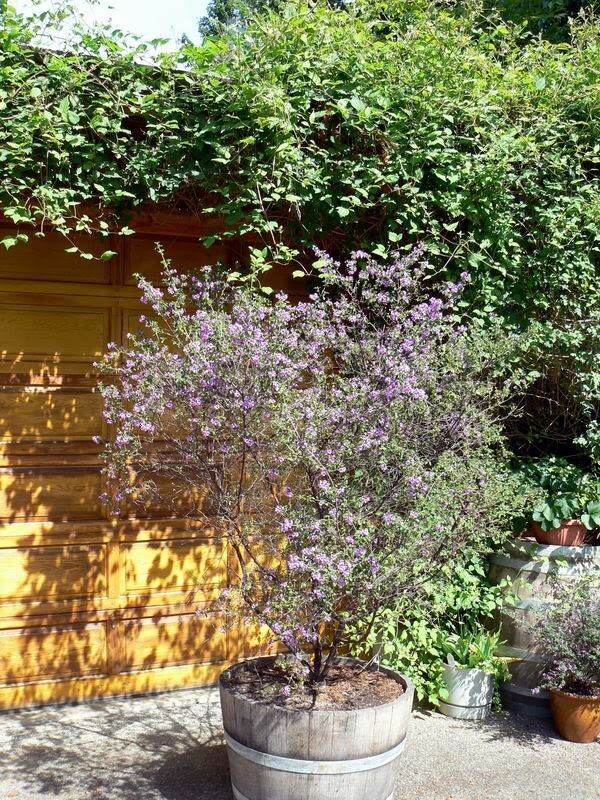 The last picture shows our large Australian Bushmint (in a barrel on wheels) in front of the garage door. Because I thought fledging might be imminent, the Bushmint was kept against the garage door so that if a fledgling fell it would at least land in the foliage. 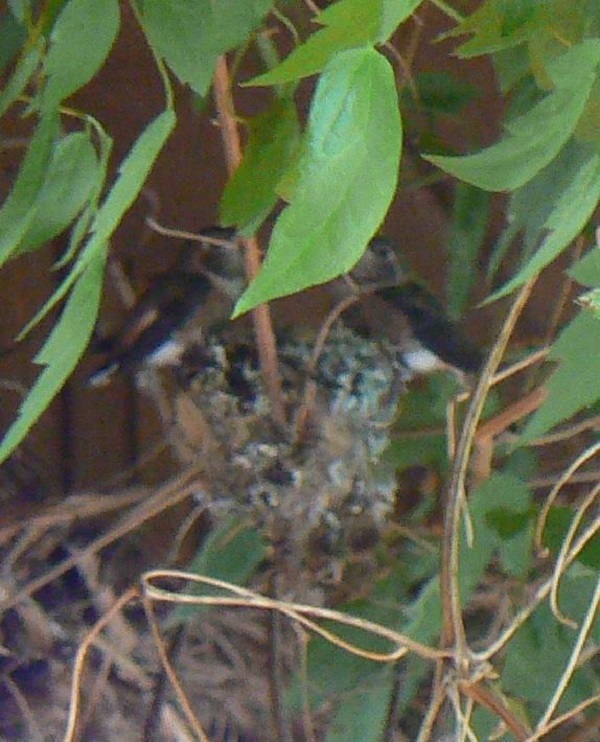 From the next photo, it looked as though those little ones were on the verge of leaving the nest. If nothing else, the Bushmint was great at keeping people from parking too close - our visitors were quite unaware! In the next day or so those little ones were spending time on the edge of the nest. The weather was warm for here (over 27C/80F). 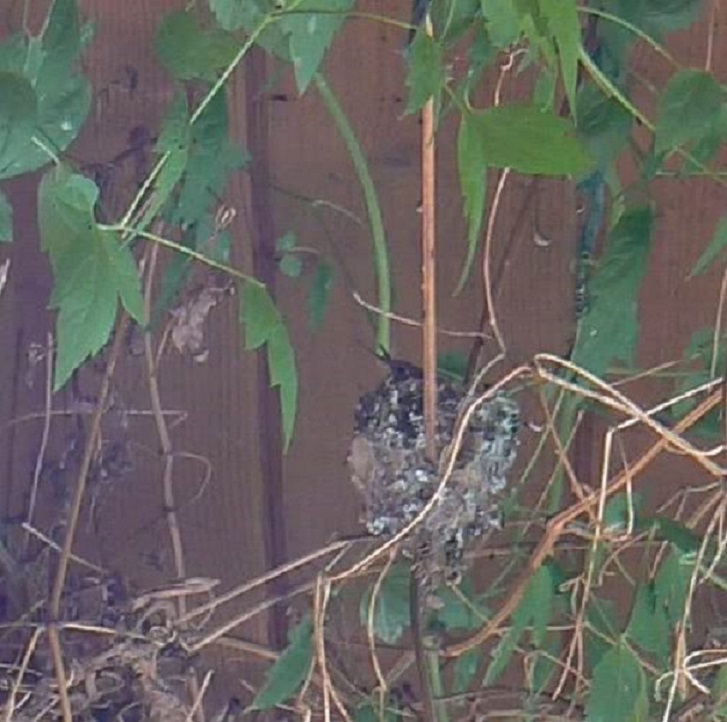 Here's how they looked on June 1st, indicating that fledging would likely be soon. They really were very well hidden up there. Raising the vine and nest a bit the previous fall had obviously helped, as it had sagged quite a bit. 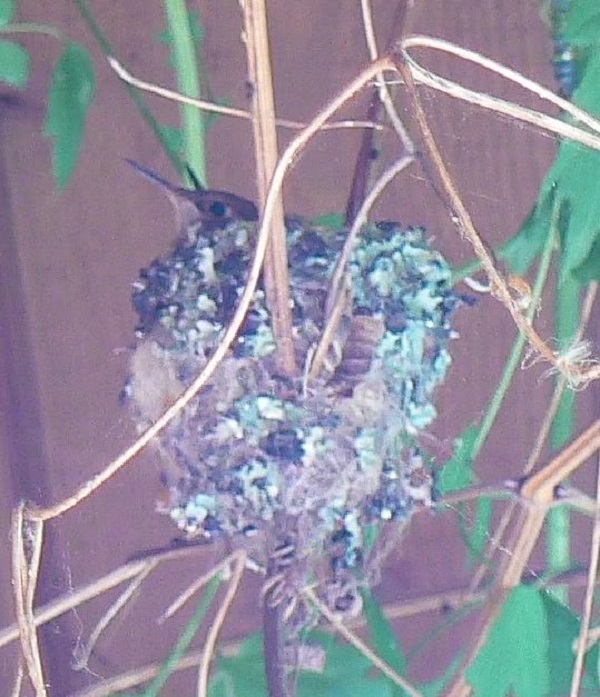 June 2 2009 - Both little hummers fledged successfully. 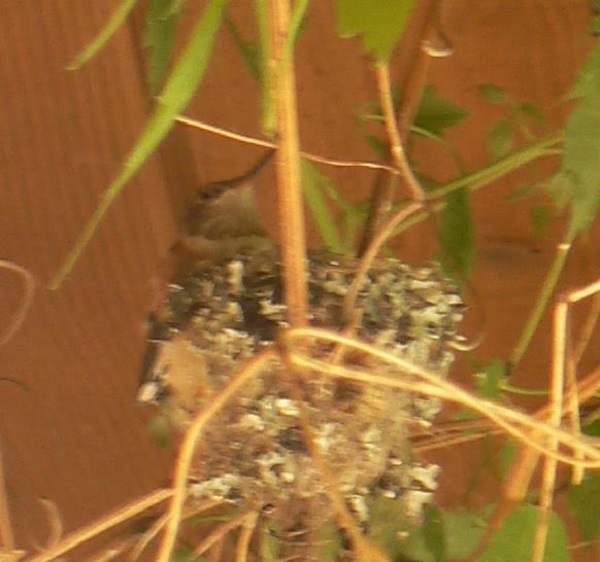 When I looked and took a picture of the nest late that morning I saw only one little one left on the nest. An hour or so later when I looked out, through the window, I saw a little one on the vine! And the nest appeared to be empty. Picture below taken through dirty window, zoomed and cropped! 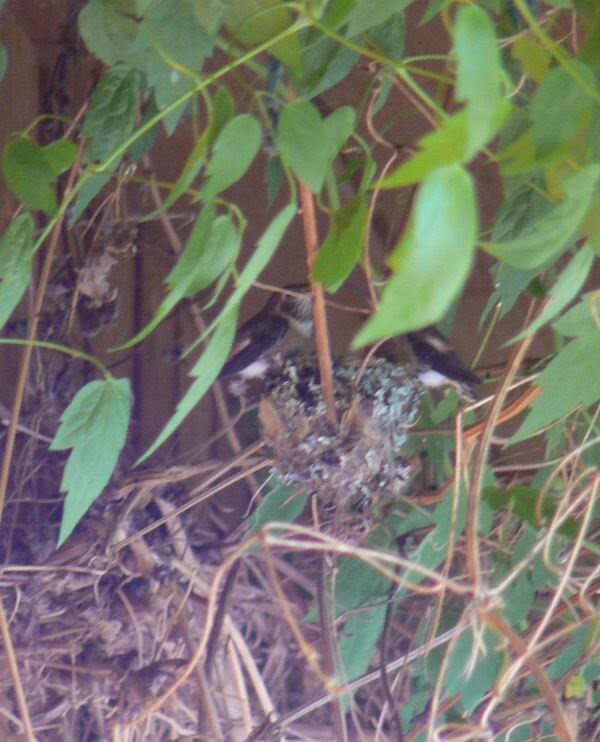 While I was unloading those pics my husband called to say that mother Rufous was there attending the one on the vine, with a second one hovering behind her! So mom and sibling came! I hurried to get card back in camera and when I got back to the window mom and sibling had left - and even as I focused and tried for a video while the little one was wing stretching - a bumble bee buzzed it and IT TOOK OFF, around the corner of the garage! I missed that 'photo op' but was elated that they had successfully fledged. I looked for them at the feeders, but couldn't really tell who was who! 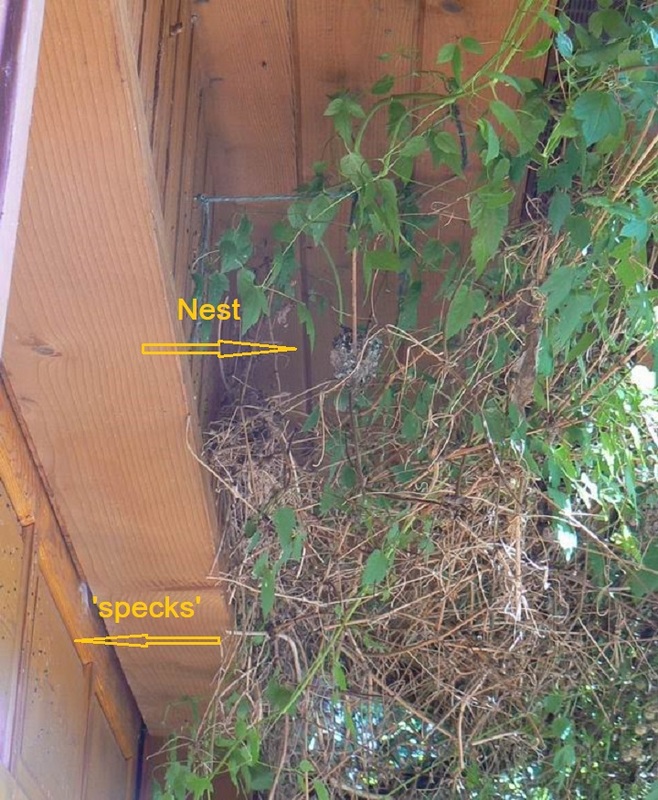 Wow, what great documentation of the rufous and her nest! You certainly worked hard to help her out. Great pictures! Also, I see what you mean on having to weight down the feeders in your previous post; that would have been helpful where I lived in western Oklahoma with all that wind on the prairie. Ruby throated hummingbird females; second photograph shows the longer beak of the female with her tongue sticking out just after feeding. The females have longer tongues for feeding their young. Notice the lack of red on the throat area. 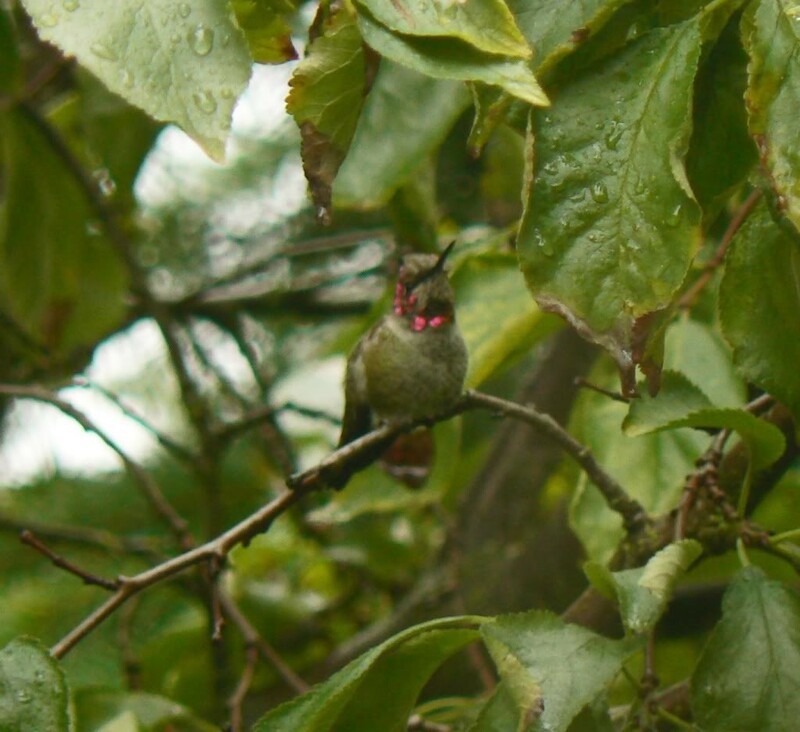 Juvenile ruby throated hummingbird; a little smaller, most resembling the female at this stage with not as much coloration. 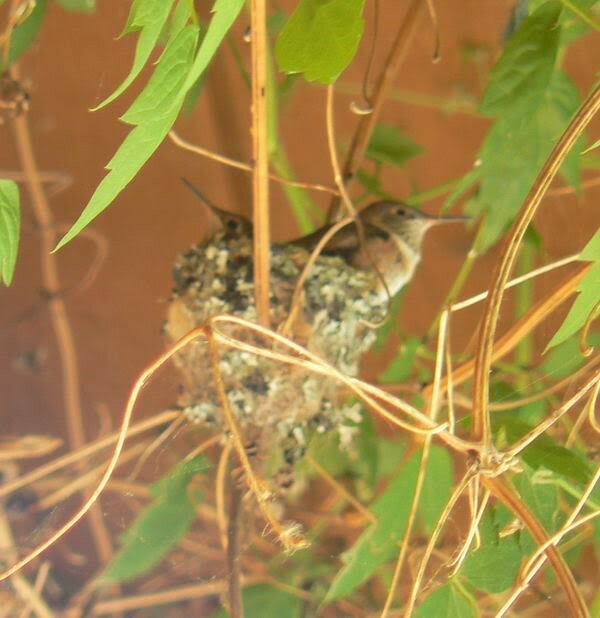 It's nice to see more photos of your hummingbirds, RBMom - and your sister's. I have only ever seen the Rufous and Anna's here, so it is interesting to learn about other hummingbirds in different parts of N. America. I realized when I first started watching them that the immature ones take a while to get their full adult feather colours. Here is a young Anna's male at the feeder, with his blotchy/patchy iridescence showing. I guess it takes a while before all the 'fluorescent' feathers get their blazing colours. 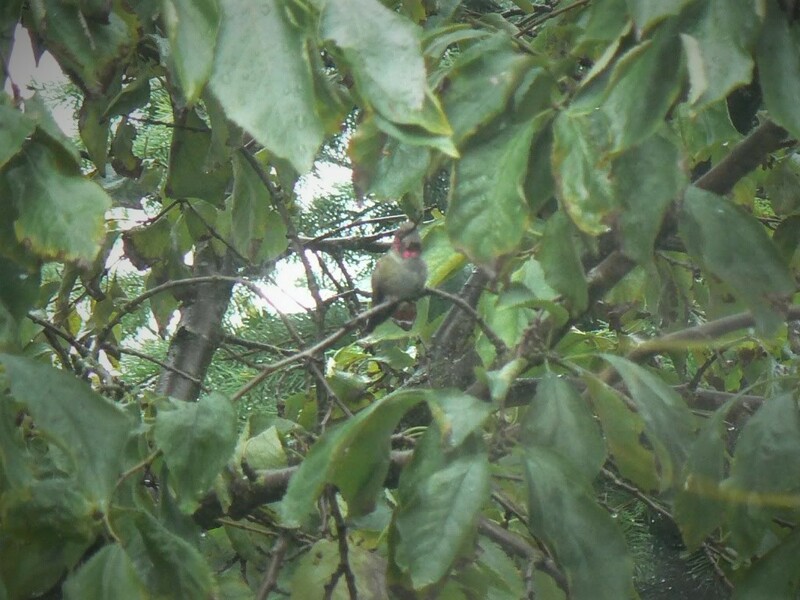 I first had a glimpse of an immature male Anna's 'hidden' in our plum tree in late spring. I think these little hummers are easier to photograph as they seem to perch more than the Rufous, which seem to be constantly on the move. Vanislander.....great pictures. I wish I did not have to take mine through two windows. The Rufous I understand is more aggressive and feisty than all the other hummingbirds, so that is probably why they do not perch much; that could be because they are one of the smallest and they have to make up for it with aggressive behavior. Our Ruby Throated hummers are still around until late September or Mid-October, as we are further South. They are at our feeders every 5-10 minutes bulking up for their long migrations. I am going out to feed them this morning. They buzz me periodically and know when I am putting fresh food in. We get some through the winter in our area, but I have never seen them at that time. I pull my feeders at the end of October and put them back up the first of April. I've fallen behind on my following your Hummer adventures, Van and RB. All this information, and the photos, is/are fantastic.